Luxury hotels are in business to sell a luxury experience. It’s what defines the category. The product is aspirational, exclusive, and extraordinary. It’s special and it tends to cost more than the average hotel stay. That means connecting with a special class of customers — or a customer in a particular mindset — who want to feel like they’re getting only the best. Having a strategy is important to all hotels, but luxury hotels, especially, should ask questions first and make sure they know their customer before experimenting with social media marketing. Reaching and connecting with luxury travelers comes at a premium, so poorly planned forays can have a long-lasting cost. 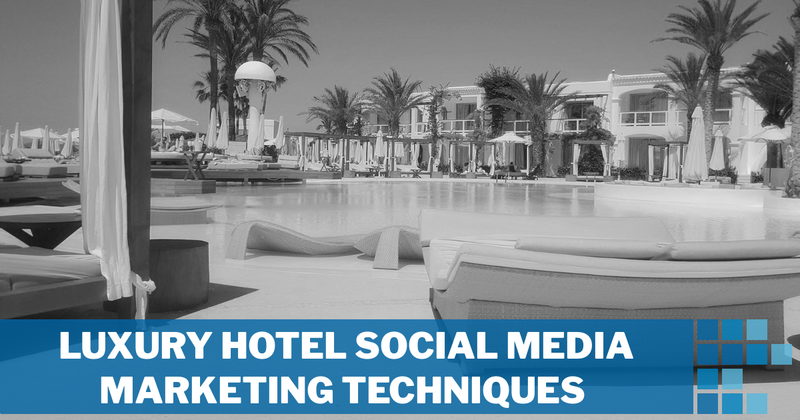 These luxury hotel social media marketing techniques will help a company stand out from the crowd and get it right the first time. A special experience that is distinctly different from everyday life. The content of luxury hotel social media marketing posts should focus on what makes the property exceptional — be it world-class dining, scenic views, or an exclusive location. Service that takes care of everything. Typically, these are not DIY travelers, so social media posts should offer guided and curated experiences. To feel that they are staying with like-minded luxury travelers. Influencers who have established audiences on networks like Instagram can lend a great deal of credibility to establishing that a luxury hotel is cool enough to attract the right kind of people. Calm before the storm in ibiza with the family ?? @jayalvarrez posted this photo from a stay in Ibiza last year. With over 4 million followers and a remarkably high engagement rate, it’s no surprise that he’s a top-ranked travel influencer. Just as a connection with an Instagram influencer can be leveraged to increase your luxury hotel’s brand awareness and lend it social proof, influencers are also an important way of gauging what other luxury hotels are doing to market themselves. Influencers depend greatly on knowing their audience, so a survey of their posts can give a snapshot of what luxury travelers want. This photo from @alexstrohl weaves the mention of accommodation into a larger story about travel plans. Social media has changed a lot about the speed and distance involved in connecting with customers, but the fundamental principles of the hospitality business are still the same. Offering a courteous and generous welcome and solving problems for customers are the two best ways to connect with someone who stays at your hotel. By watching: Social media profiles are connected to information like names, email addresses, and phone numbers that customers provide when booking a stay. The public posts to these accounts can be used to guide how a luxury hotel caters the guest’s experience to their particular tastes. Here a blogger is reaching out for hotel suggestions in England, a great luxury hotel social media marketing opportunity. Companies that are signed up for Facebook or Twitter have made an implicit commitment to reply to messages. Silence almost always makes things worse, so respond quickly. It may sound counter-intuitive, but it can often be better to publicly resolve an issue bothering a guest than to figure it out offline, behind closed doors. Followers, including potential guests, know that despite best intentions things happen and no one is perfect. They’d rather see a courteous, human resolution than a copy-and-pasted “sorry for the inconvenience, please DM us.” (Obviously, this rule will have to flex for cases that involve sensitive or personal information.) Don’t immediately go offline. If a guest has a public profile where they post frequently about their love of bourbon, having a small bottle waiting for them could be appropriate. But judge how personal the posts are and don’t overstep boundaries, especially for first-time guests. Don’t be creepy. Think of social media as just another way for guests to get in touch during their stay. Asking for information through a Facebook message is no different than calling the front desk or speaking to the concierge in person. Apply the same luxury service standards to social media as you do to traditional interactions with guests. Many facets of luxury hotel social media marketing involve building awareness and creating the demand for a luxury experience by telling aspirational stories. Some parts of the game plan should also lead more directly from existing demand to bookings. In other words, a large portion of guests has already decided that they’re going to South Africa, Switzerland, or Singapore and the objective should be to convince them to stay with your hotel. A recent glowing review left via the Venetian Macao’s Facebook page. Evidence suggests that at this point customers are most concerned with the word-of-mouth (digitally speaking, at least) information they can get from online reviews. (See this survey study of luxury hotel social media marketing for more detailed evidence on the effect positive reviews can have.) Google, Yelp, and TripAdvisor, in particular, have all trained customers to look at star ratings and give even more weight to reviews written by actual guests. Ending a guest interaction on Twitter or Facebook by asking for a review probably won’t yield positive results — and might leave a sour taste after an otherwise positive resolution. Instead, save the tactful suggestion that a guest might want to leave a review for business cards, in-room comment cards, and emailed receipts. And, once they have been made, there are plenty of ways to leverage your guests’ reviews. 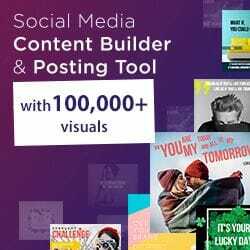 On Instagram, overlay the text of a glowing review on top of a photo that features an aspect of your property — e.g., the signature dish from the restaurant, a sunset view, or one of the super-comfortable beds — that is mentioned in the review. Tweet an excerpt from a positive review and link to your hotel’s TripAdvisor page — both so that potential guests can see other great reviews and to remind past guests to post their own review. Post a positive review on Facebook with an appropriate photo and encourage followers to share their own similarly positive experiences in the comments. Establishing a presence on major sites for travel reviews including TripAdvisor, Yelp, and Facebook (where the review feature is built into company pages) and then using social media to build awareness until there is a minimum viable number of reviews. Measuring which site is the most valuable for driving bookings. Expand on what they know about their customers. Be helpful and establish relationships with potential and current guests. Emphasize the importance of positive reviews on social media. We’d love to help your luxury hotel put these ideas into practice. Get in touch and we’ll start working with you to create a social media strategy that suits your needs.